Death on the Nile is a 1978 British mystery film based on Agatha Christie's 1937 novel of the same name, directed by John Guillermin and adapted by Anthony Shaffer. The film features the Belgian detective Hercule Poirot, played by Peter Ustinov, plus an all-star supporting cast including Maggie Smith, Angela Lansbury, Bette Davis, Mia Farrow, David Niven, George Kennedy and Jack Warden. It takes place in Egypt in 1937, mostly on a period paddle steamer on the River Nile. Many of the cultural highlights of Egypt are also featured in the film, such as the Great Pyramids, the Sphinx, and temples at Abu Simbel and Karnak, even though the locations are not in sequence. The boat trip starts in Aswan, follows to Karnak and then to Abu Simbel which is upstream from Aswan. Furthermore, it was never possible to go by boat from Aswan to Abu Simbel, even before the Aswan Dam was built because of the cataracts near Aswan. Death on the Nile won the Academy Award for Best Costume Design at the 51st Academy Awards. Jacqueline "Jackie" de Bellefort asks her close friend, wealthy heiress, Linnet Ridgeway, to hire her fiancé, Simon Doyle since he is broke. Jackie is initially pleased when Linnet agrees, but Linnet and Simon soon start a whirlwind affair and end up marrying. While honeymooning in Egypt, they are continually hounded by the jilted Jackie. In an attempt to get away, the Doyles pretend to go to the Cairo Railway Station before backtracking to board their booked cruise on a Nile paddle steamer, the S.S. Karnak. When the passengers venture on-shore to examine a nearby temple, a large stone is pushed off a pillar and narrowly misses the Doyles. They are shocked when Jackie finds them and joins the cruise, having ignored the warnings of detective Hercule Poirot to stay away and having revealed that she carries a small automatic pistol in her handbag. That night, Jackie confronts Simon in a drunken rage and shoots him in the leg. The next morning, Linnet is found dead from a gunshot wound to the head. A "J" written in blood on the wall above her bed appears to implicate Jackie, but she has a solid alibi as Miss Bowers sedated her with morphia and stayed with her all night. Poirot and his friend, Colonel Race, investigate. They discover that numerous passengers had reasons to kill Linnet: Louise Bourget, Linnet's maid, was bitter due to her mistress' refusal to grant her a promised dowry; Andrew Pennington, Linnet's American trustee, was anxious to prevent her from discovering that he embezzled from her; Mrs. van Schuyler, an elderly American socialite suffering from kleptomania, displayed a great interest in Linnet's pearl necklace; van Schuyler's nurse, Miss Bowers, blamed Linnet's father for forcing her own father into financial ruin; Salome Otterbourne, a romance novelist, was being sued for libel due to a likeness between Linnet and one of her characters; Mrs. Otterbourne's daughter, Rosalie, was anxious to protect her mother from financial ruin; Jim Ferguson, an outspoken Communist, resented Linnet's affluent lifestyle; and Dr. Ludwig Bessner, a Swiss psychiatrist, faced exposure by Linnet concerning his unorthodox methods involving one of Linnet's past friends. Soon a bundle is found in the Nile. The missing pistol is wrapped in Mrs. van Schuyler's stole, which has a small bullet hole in it. A handkerchief was also included, stained with blood, and a marble ashtray to make sure it would sink to the bottom of the Nile. They later discover that Linnet's pearls are missing, and Mrs. van Schuyler denies ever having touched them. Soon after, the pearls are found on Linnet's body, so Poirot deduces Mrs van Schuyler has "returned" them. While Poirot and Race conduct their investigation, Louise Bourget is murdered. Her throat has been cut with one of Dr. Bessner's scalpels and a fragment of a banknote is found in her hand. Poirot deduces she saw the murderer coming out of Linnet's cabin and attempted to extort money for her silence. Salome Otterbourne claims to have seen Louise's murderer and is about to tell Poirot and Race when she is shot in the head through an open cabin door with Pennington's revolver, too large to have been used on Linnet. Poirot gathers everyone in the saloon and reveals that Simon is responsible for Linnet's murder, with Jackie working as his accomplice. She pretended to shoot Simon, drawing attention to herself. After running to Linnet's cabin and shooting her in the head, Simon shot himself in the leg, using Mrs. van Schuyler's stole as a silencer and replaced one of the empty cartridges with a new one should the gun ever be found. He then wrapped the gun in the stole along with a marble ashtray and the supposed blood stained handkerchief and threw them out the open window; hoping they would sink into the Nile. Jackie later killed Louise, who was blackmailing Simon because she witnessed him enter Linnet's cabin, then killed Mrs. Otterbourne, who saw Jackie exiting Louise's cabin. The plan was that Simon would marry then kill Linnet, inherit her money, and at a later date, marry his old love. When Simon points out that Poirot has no proof, Poirot reveals that the police will simply do a gunshot residue test known as a moulage test on both him and Jacqueline. Realizing they are caught, Jacqueline confesses before embracing Simon. Poirot suddenly realizes she has taken back her pistol, but is unable to prevent her from shooting Simon in the head before killing herself. The passengers depart when the boat next docks, while Poirot is thoroughly congratulated for his work. EMI Films had a huge success in 1974 with a film version of Murder on the Orient Express, and wanted a follow up. The movie was made during a period of expansion for EMI Films under Michael Deeley and Barry Spikings, who were increasingly aiming at the international market with films like The Deer Hunter and Convoy. Death on the Nile was a more traditionally British film. Albert Finney played Hercule Poirot in Orient Express but was unable to reprise his role in the follow up. The producers felt if they could not get Finney they should go in a totally different direction and picked Peter Ustinov. "Poirot is a character part if ever there was one," said producer Goodwin, "and Peter is a top character actor." As with Orient Express, an all-star cast was used. This was Jane Birkin's first British movie in a decade. The film shot seven weeks on location in Egypt in late 1977. Four weeks filming were on the steamer Karnak (the historic ship SS Memnon) and the rest at places such as Aswan, Abu Simbel, Luxor, and Cairo. Desert filming required makeup call at 4 a.m. and shooting at 6 a.m. to accommodate a two-hour delay around noon when temperatures hovered near 130 °F (54 °C). Bette Davis wryly commented, "In the older days, they'd have built the Nile for you. Nowadays, films have become travelogues and actors, stuntmen." John Guillermin commented that the Egyptian government were supportive of the film because there were so many Agatha Christie fans in the country, and the story "was unpolitical". During the shoot, troubles arose as no hotel reservations had been made for the crew. They were subsequently shifted from hotel to hotel, sometimes on a daily basis. Director Guillermin was never allowed to see the rushes. By order of the producers, footage was sent directly to them in London. A lighter moment occurred during a love scene between Chiles and MacCorkindale, when a hostile desert fly landed on Chiles's teeth. The actors carried on as best they could, but the crew burst out laughing when Guillermin thankfully called "cut" and ordered another take. The more experienced people created a very generous atmosphere. They were not impatient at all. I have never worked with Bette Davis before and was told she was professional but not communicative. Well, she was an absolute bastion of support and enthusiasm. During the breaks, the cast would often sit to one side engaged in terrific conversation. There was Ustinov's great wit and Niven's dry humour. Jack Warden is a very funny man and Mia Farrow is a very funny woman. This was a bunch of people who could relax. "Poirot can be a cold fish, but here we made him more humanistic and warm, interested in young people for instance", said the director. "Peter Ustinov was able to bring that out." Costume designer Anthony Powell won the Academy Award for Best Costume Design, his second. Among his touches were shoes for Chiles that featured diamond studded heels that came from a millionaire's collection and shoes worn by Davis made from the scales of twenty-six pythons. Cinematographer Jack Cardiff says he and Guillermin decided to give the film "an old fashioned 30s look". The choreography for the tango scene was provided by British dancer Wayne Sleep. In early 1978 David Niven's daughter was seriously injured in a car accident. Niven would fly from London to Switzerland on weekends during filming to sit by her bedside. For the US market, artist Richard Amsel was commissioned to do a film poster which reflected the US public interest in "King Tut" at the time. Although it was a British film, Death on the Nile first premiered in New York, on 29 September 1978, to coincide with the sale of tickets for the Metropolitan Museum of Art's opening on 15 December 1978 of the travelling exhibition The Treasures of Tutankhamun, which had piqued interest in Egyptian artefacts. For the US market, artist Richard Amsel was commissioned to change the original British poster art by including the profile of King Tutankhamun with ceremonial knife (and modern revolver), surrounded by the cast. In London, there was a Royal Charity Premiere at the ABC Shaftesbury Avenue on 23 October 1978, attended by the Queen, Prince Philip and Earl Mountbatten. The film was expected to be popular with audiences following on the heels of Murder on the Orient Express, the most successful British film up to that point. However, the box office return was $14.5 million in the United States, lower than the $25 million high for Orient Express. The Times' film critic David Robinson had mixed feelings about the film. Although it was entertaining, and followed the formula of the Murder on the Orient Express film four years earlier, he found it a bit too long and not quite as good. He concluded that screenwriter Anthony Shaffer and director John Guillermin were not quite as suitable to handle Agatha Christie's rich material as Paul Dehn and Sidney Lumet had been when they worked on Murder on the Orient Express. Death on the Nile has received generally positive reviews by contemporary film critics more than 30 years later, with an 80% fresh rating on Rotten Tomatoes. A third Poirot film Evil Under the Sun was meant to come out in 1979 but was not made until several years later. ^ "TIMESPAN Even the palms have to be made". The Canberra Times. 8 December 1977. p. 23. Retrieved 10 December 2015 – via National Library of Australia. ^ People Chicago Tribune 2 Dec 1977: 20. ^ a b "Death on the Nile". Box Office Mojo. Retrieved 29 September 2010. ^ "Death on the Nile". Turner Classic Movies. Retrieved 1 March 2016. ^ Mills, Bart (2 September 1977). "British money is suddenly big in Hollywood,'right up with Fox and Warne r.'". The Guardian. London (UK). p. 8. ^ a b The case of the vanishing mystery writer: Christie liked only two of the 19 movies made from her books. Mills, Nancy. Chicago Tribune 30 Oct 1977: h44. ^ Mills, Nancy (11 October 1977). "When a small front need not hold you back". The Guardian. London (UK). p. 9. ^ Mann, Roderick (11 December 1977). 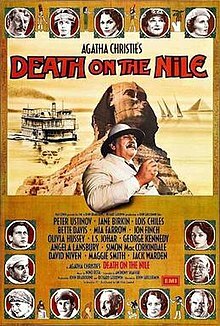 "Movies: Staying Afloat in Egypt for Agatha's 'Death on the Nile'". Los Angeles Times. p. x61. ^ a b c d Lee, Grant (20 September 1978). "FILM CLIPS: Life on the Nile With Guillermin". Los Angeles Times. p. f14. ^ MOVIES: DAVID NIVEN LIKES LIVING IN LUXURY Mann, Roderick. Los Angeles Times 1 Oct 1978: o31. ^ "Death on the Nile". Rotten Tomatoes. This page was last edited on 18 March 2019, at 23:05 (UTC).